I would have to say there are two redeeming things about the United States Post Office for me. 1. Vintage post office boxes. Love them. I always love to go look at the numbers and decoration on them. 2. Stamps. I love stamps. But let me refine that statement. I love pretty stamps. I always seem to hold up the ridiculously long line (why is there always a long line at the post office? If the post office had a better designed website, I guarantee there wouldn’t be anymore… anyhoo!) to ask “Do you have any cool stamps in?” Of course they do! And the thing I LOVE about the cool stamps is that you are paying the same price as the boring ones but you get a little bit of fabulousness that goes on your letter! It is something so little that just makes me so happy. There’s nothing like a Snoopy sticker, or pretty Christmas ones. NOTHING. I’m mailing out self promos to everyone I can think of that I would want to work for. I have an awesome envelope and I *think* the contents are pretty. 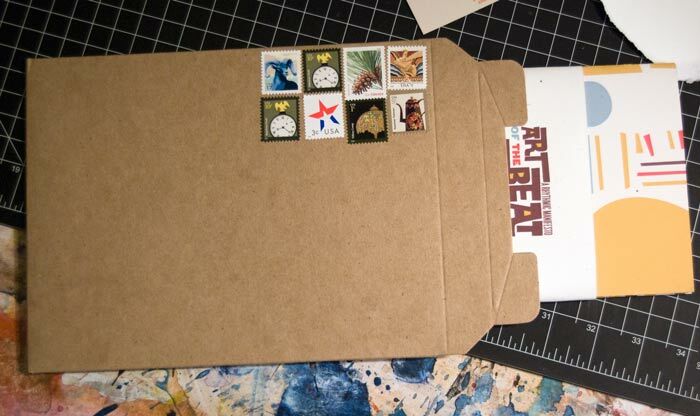 The shipping is $1.90 for each envelope. 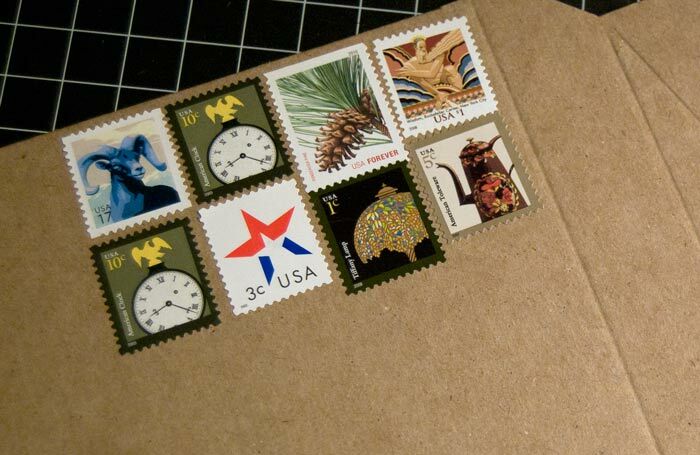 After my third visit to the Post Office, I realized I could just put at many stamps on it as I wanted as long as it equaled $1.90. (My teacher Jamie Mixon had given me that idea a few months ago). I think it makes is soooooo much more fun. Hopefully the people getting them will think so too. Okay. I’m not a huge fan of that deer looking thing, but it was 17 cents! I’m in love with the 5 and 10 cent stamps. I think I’m going to address several with just that. That will be a lot of stamps and probably a lot of work for the Post Office. BUT that is what I’m paying them $1.90 to do, right?! Okay. But let’s get to the good stuff. Obviously the Post Office in Yazoo City, Mississippi is not going to have very interesting stamps available to me. Thank goodness other people appreciate this kind of stuff. 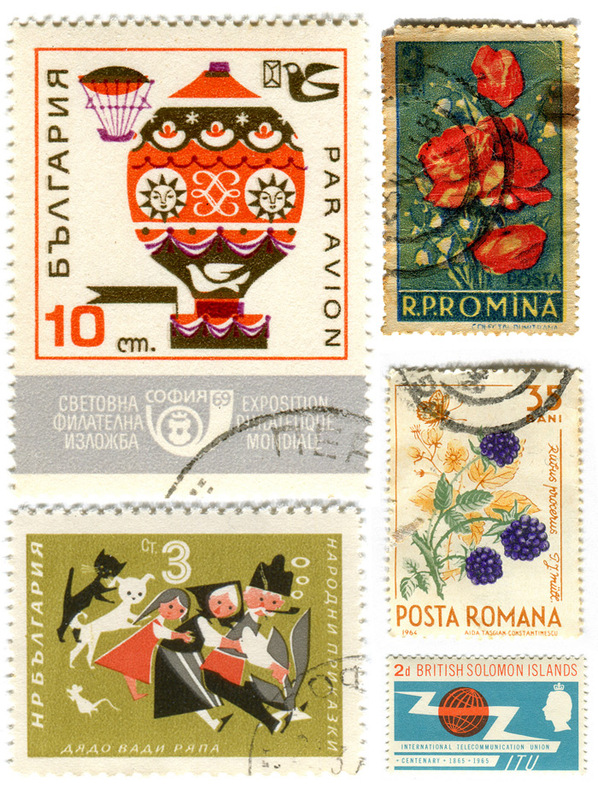 Go check out one of my favorite collections on flickr – Vintage Stamp Collection. Here’s a sampling of her collection!!!! So good! Ummm…. Kate. I didn’t know you blogged! Can we please get coffee some time! I’d love to chit chat about your work and blogging and design whatever your heart desires! Umm…I LOVE this! We used the same 1, 5 and 10 cent stamps on our wedding invitations. I also like the ab ex stamp collection and I think they’re coming out with a pop art collection this year. 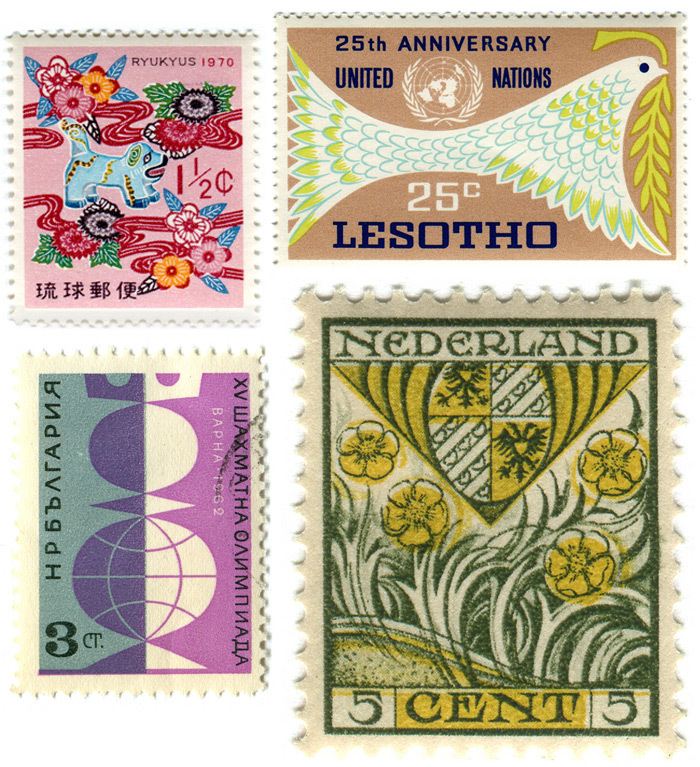 I really wish you could find a way to design a little things stamp collection without that ugly border that most design your own stamps have, I would SO buy them!